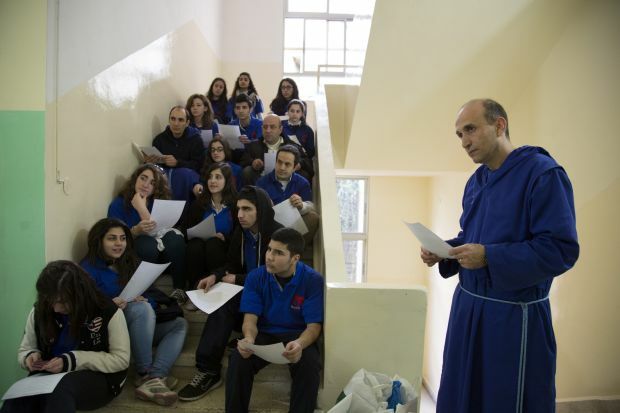 BEIRUT (CNS) — Bringing the face of Jesus to the poor is an experience a group of Lebanese 10th graders will long remember about this Lent. The students, at the Maronite Catholic-run St. George School in the Zalka section of Beirut, belong to the first Youth of Life group formed by the Lebanese order, Mission of Life. 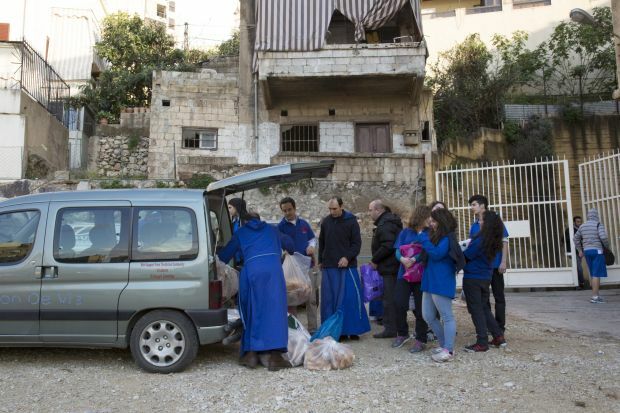 An adept organizer, Sister Lina Maria divided the group into small teams, each of which would visit two families or individuals that day, accompanied by a missionary from the order or one of its experienced volunteers. One of those visits was to Nayla, who lives in a tiny, dingy concrete dwelling adjacent to the rubble of an abandoned stone building. Catholic News Service changed her first name to protect her privacy. The elderly widow wearily answered her door, almost gruffly, but her face lit up as soon as she recognized Sister Lina Maria. The three Youth of Life teens greeted her with smiles and bags of basic food items. “I’m going to tell you stories you never heard,” she said in her raspy voice as she settled into a wobbly plastic chair beneath a collage of holy pictures — including an image of the Sacred Heart of Jesus and Lebanon’s St. Rafka affixed to the cracked wall. Nayla’s adopted street cat darted through the door, cranking his head to scrutinize the visitors, and scurried back outside. “He comes and goes as he pleases,” Nayla said, pointing to the soft bed she assembled for her feline friend, behind her on the uneven tile floor. She opened the stained door next to her to reveal a cubbyhole area for cooking. Without revealing details of her personal predicament, Nayla mentioned that someone recently said to her, “You have (grown) children. You don’t need help,” a remark made with the assumption that her children would care for their elderly mother. 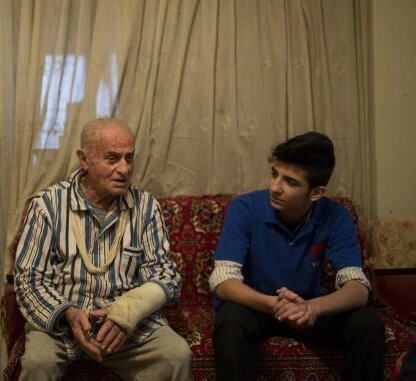 “But a priest came to visit me and said that I do need help,” Nayla added. The Mission of Life community visits some 350-400 impoverished families each month as part of its Streets’ Mission, reaching out to all in need, regardless of age, color, race or religion. Its missionaries are easily recognized by their royal blue habits, with volunteers wearing T-shirts in the same color, affixed with the order’s logo depicting helping hands. Founded in 2000, the order, more commonly known by its French name “Mission de Vie,” is devoted to serving the poorest of the poor in the country. Aside from the 33 sisters and brothers in the order, more than 500 volunteers are involved in its mission. About 100 of them have completed the “School of Life,” a spiritual and humanitarian formation program carried out over four years. After their mission, the St. George students regrouped with Sister Lina Maria at the school. They gathered in a circle and prayed, thanking God for the experiences and asking blessings upon the people they had visited. Sister Lina Maria asked the students to share some of their impressions of the visits.